In 1989 was the fall of the Berlin Wall. Car theft in Europe doubled as there were not many BMW and alike vehicles in eastern Europe. This was a good opportunity for enterprising people to steal cars to order and make a fortune. Some of the larger insurance companies made the call to not insure vehicles without manufacturer fitted immobilisers. This meant that only immobiliser fitted vehicles qualified for finance and sold in dealerships. In 1995 Mercedes and BMW made a big change in their cars. They added a factory fitted immobiliser system called EWS that used Philips rolling code id33 chip. This consisted of a transponder chip embedded in the plastic key head that gives the ECU (computer) a signal that would allow the car to start and run. This reduced car theft of these vehicles dramaticaly. By 1997 all European cars had a similar system. 1998 the Japanese car manufacturers followed. FACT: Without the chip key the car will not run. FACT: This system cannot be tampered with, or hot wired. FACT: It is essential to always have a backup key. FACT: A Few well equipped Specialists can clone or program a spare key FROM THE ORIGINAL or re-programm or re-flash the car ECU. FACT: If you lose your ONLY key, you have few options, but the price is quite a lot more, sometimes $600 up to thousands dollars depending on the vehicle make. THERE ARE NO MAGIC TRICKS OR SHORT CUTS. 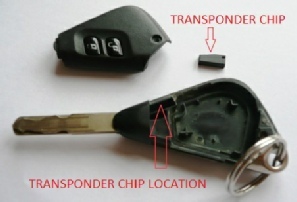 BELOW ARE A FEW EXAMPLES OF KEYS WITH TRANSPONDER OR IMMOBILISER CHIPS.